Wendesday in the kitchen -RECIPE | A.B.E. Remodeling, INC.
Hello Everyone... just thought on this dreary rainy day we would post a comfort foodie casserole. Warm your oven so warming in your kitchen. I found this on allrecipes and made an alteration or two so it is not exact. I actually made this and the whole family liked it so give it a try. and it's easy to make. Let us know if any of you give it a try. great way to use leftover ham. 2 cups diced cooked ham or deli ham slices cut into strips. 2 cups shredded Swiss cheese or cheese of your choice. Bring water to a full rolling boil in a pot.. Cook the egg noodles in the boiling water, stirring occasionally, for 3 minutes; remove from heat, cover, and let stand until the noodles are tender, about 10 minutes. Drain. 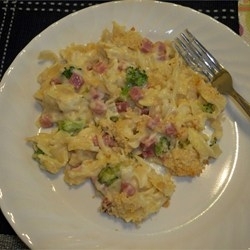 Stir the noodles, onion, sour cream, chicken soup, ham, and Swiss* or any cheese together in a large bowl. Season with salt and pepper. Spoon into the prepared casserole. Sprinkle the top with bread crumbs. Bake in the preheated oven until the casserole is bubbling and the bread crumbs have browned, about 40 minutes. ENJOY ! Have a pleasant day.